Granite countertops are one of the most popular kitchen upgrades there is, due to the attractive appearance and overall durability. Adding granite countertops to your kitchen or bath adds instant beauty and instant value to your home. Some home buyers won’t even consider buying a home without granite countertops. 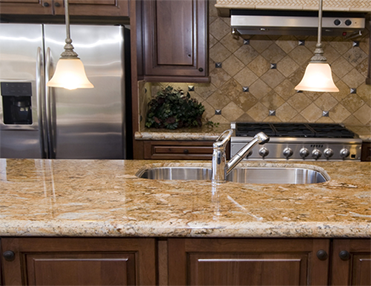 Granite countertops are rock solid – no pun intended. Granite is an igneous rock, meaning it was formed when the magma from beneath the earth’s surface cooled, or at the surface when lava cooled. Granite is comprised of many different kinds of crystals that solidified when the magma cooled. Crystals include quartz, mica, feldspar, hornblend and biolite. The crystals are seen when granite is cut and polished, and depending on the type of crystals and how prevalent they are in a slab, the color can range from pink to tan to grey to black. The cost of granite countertops is affordable for most homeowners. Especially when you get your new granite countertops through Advanced Stoneworks. We buy in bulk, and pass the savings on to you. We have thousands of granite slabs to choose from, in an amazing variety of colors and patterns. Granite is priced per square foot (including removal of old countertops and installation of your new countertops) and varies based on the particular slab you choose. We offer 3 standard edges to choose from at no additional cost. When you come to choose granite for your new countertops, make sure you have the basic measurements of your existing countertop surface, as well as any island you currently have or plan to add. It’s also helpful to have pictures on your phone of the color of your flooring and cabinets (or samples if you’re doing a full remodel) to help you choose the particular color of granite that will complement the rest of your kitchen or bath. Call Advanced Stoneworks at 251-408-7818 for a free estimate for your granite countertops, or stop by our showroom. Our cost of granite countertops can’t be beat. Serving all areas within a 2 hour drive from Mobile Alabama.